The 2019 North American International Auto Show, held annually in Detroit, kicked off its press preview yesterday. This year is the show’s last time taking place in January, as the traditionally winter show will be moving to June starting next year. Let’s look at some of the yesterday’s most exciting highlights. The winners of the 2019 North American Car, Utility and Truck of the Year awards were announced, and Hyundai had quite a good day. The Korean-based manufacturer took prizes for both the “Utility of the Year” and “Car of the Year” categories, while “Truck of the Year” went to the Ram 1500. The NACTOY awards are chosen by a panel of 54 jurors from print, online, radio, and broadcast media across the U.S. and Canada. Winners are determined based on a variety of factors including segment leadership, innovation, design, safety, handling, driver satisfaction, and economic value. Ford wowed attendees by unveiling its most powerful Mustang ever. The 2020 Mustang Shelby GT500, which boasts a 5.L V8 engine outfitted with a 2.65L supercharger wedded to a dual-clutch transmission, produces more than 700 horsepower. 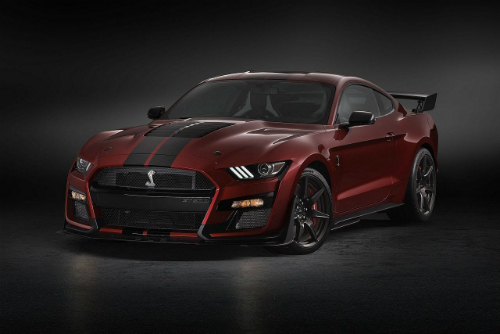 Sure to be a killer at the track, the 2020 GT500 has a striking look brought about by its wider body and aggressive aerodynamic package. Lucky reporters and industry onlookers got to experience the vehicle through virtual reality headsets provided by Ford. There’s no official horsepower or price-tag figures released yet, but it’s safe to say this bad boy won’t be cheap. In the biggest blunder of the show, Infiniti tried to unveil it’s QX Inspiration electric concept car, but the vehicle had technical difficulties and sputtered out before it could reach the stage. Said to be a preview look at the design of the company’s slate of upcoming electric vehicles, Infiniti has advertised the Inspiration as having a highly-stylized exterior and “lounge-like” interior. Attendees were able to get a brief glimpse of the defunct machine in the hallway, at least. Sports car fans rejoice, because the Toyota Supra is back! The highly-tunable sports car immortalized in “The Fast and the Furious,” was discontinued roughly two decades ago. Since then, sports car aficionados have been pining vocally for its return. Toyota has finally granted their wish with the 2020 Toyota Supra, which CEO Akio Toyoda describes as “totally lit.” The Supra will initially be available in two trims, with the base starting at $50,920. Additionally, there will be a limited 1,500-car Launch Edition offered for $56,180. Read More: What’s the Most Popular Car in Texas? This entry was posted on Tuesday, January 15th, 2019 at 8:32 pm	and is filed under Ford, News, Toyota. You can follow any responses to this entry through the RSS 2.0 feed. You can skip to the end and leave a response. Pinging is currently not allowed.